Custom golf clubs built from high-quality golf club components are in every pro players bag nowadays. However, are they just meant to look fancy, or is there a good reason to have them? They say that the key to playing golf well is to hit the ball right every time. While that’s true, it isn’t a beneficial piece of advice. What if my posture, form, and technique are all correct, but my shots are still off? Then, I asked myself - if all of the top players in the world have top of the line golf club sets and custom golf clubs that suit them perfectly, why shouldn’t I? 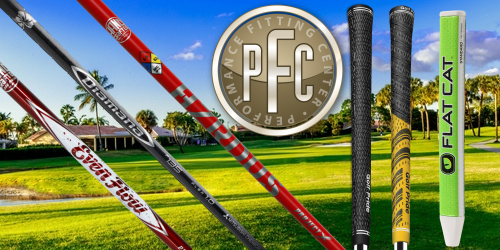 We offer a broad selection of custom golf clubs from the world’s most respected brands. Rest assured, we have everything - from Harry Taylor's renowned wedges to the handcrafted marvels of Miura golf clubs. What’s more, we offer all of the parts and accessories that any golfer could dream of needing. Let’s dive in and take a closer look. All of our custom golf clubs and golf club components are high-grade. Our golf shafts are offered in a wide variety of different flex options and made out of steel, graphite or a mix of the two. Not only that, but we have a shaft for every type of golf club head out there. That includes drivers, irons, putters, wedges and more. Some of our most popular choices include Mitsubishi, Miura, Graphite Design, Project X, AeroTech and several more. The golf heads we offer are arguably the finest in the world. Miura’s forged heads are a particular favorite for us and pro golfers alike. Once fitted, players can then take full advantage of our competitive prices. Beginners can always choose a more novice-friendly head (which we recommend) or, if they’re an experienced player, they can go for top-of-the-line right away. Some of our most popular golf club components include the most exceptional golf grips and shaft adapter tips money can buy. Shaft adapters allow players to use a wide variety of different heads with their shafts. They’re nifty little items, as they can make practically any shaft ready-to-play right out of the box. Because of that, they’re especially popular when building custom golf clubs. Lastly, not only do we carry the best golf club components in the world but we also have a full line of golf accessories. Among them are hats, rangefinders, apparel, as well as wireless headphones for those of us who like to listen to music while we’re out on the course. Our golf accessories aren’t just there to dazzle - they can make a player’s life a lot easier and can even help them play better. It’s safe to say that every pro golfer has a few accessories to go with their custom golf clubs or premium golf club sets. Why shouldn’t you? Tour Shop Fresno is a leading supplier of custom golf clubs, golf club components, and accessories.